Ulysse Nardin Oil Pump Hour Striker Rose Gold Limited Edition 18 Pieces. 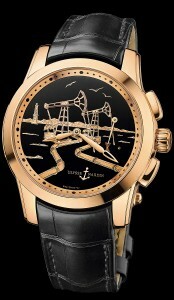 42mm rose gold case, automatic movement with 42 hour power reserve, and exhibition glass back. Every hour (or on command) the crisp sound of the gongs being struck can be heard to chime the hours, the oil pumps will start to move in sync with the sound of the chimes as if to extract oil from the gound. Shown on elegant leather strap with rose gold folding buckle.